onions, cucumbers, peppers, and tomatoes fresh from the garden, mixed with vinegar, spices, sugar, and prepared mustard. Yummy! I have an abundance of onions, cucumbers and tomatoes in my garden now. After searching for a way to use them, I found a great recipe for a sandwich spread in my copy of Amish Country Cookbook, Vol I . It relates to our German heritage as it contains prepared mustard in addition to the vegetables. Easy to prepare and preserve for future use. One of Life’s Simple Pleasures is preserving the fruit of your labors to enjoy all year long. Grind/grate the vegetables fine. Let stand for 1 hour, then drain. Boil vegetables, sugar, salt, and vinegar for 15 minutes. Add water to 5 Tblsp flour and stir to dissolve. Add to vegetable mixture along with tumeric, celery seeds and prepared mustard. Boil until thickened. Hot pack into sterilized jars and hot water bath: pints 15 minutes; quarts 20 minutes. Cool undisturbed for 24 hours. Check seals. Label contents and date. Store in cool place. Makes approximately 6-7 quarts. Use as a condiment for hamburgers, hotdogs, lunch meat, chicken, pork, or all by itself with butter or cheese. I think the uses are endless for the creative mind. 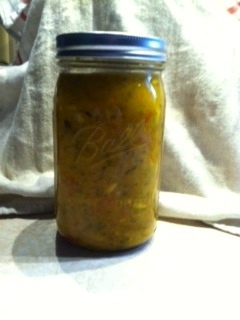 This entry was posted in activities, DIY, food preservation, gardening, gift ideas, Life's Simple Pleasures, Recipe, Seasonal and tagged amish country cookbook, condiment, cucumbers, garden fresh veggy recipe, green tomatoes, mustard, onions, quick and easy, sugar, sweet peppers, tomatoes, tumeric, vinegar. Bookmark the permalink.